Roy "Tin Cup" McAvoy (Kevin Costner) is a former golf prodigy who has little ambition. He owns a driving range in West Texas, where he drinks and hangs out with his pal Romeo Posar (Cheech Marin) and their friends. Dr. Molly Griswold (Rene Russo), a clinical psychologist, wants a golf lesson. She asks Roy because he knows her boyfriend David Simms (Don Johnson), a top professional golfer. They were both on the golf team at the University of Houston. Roy is immediately attracted to Molly, but she sees through Roy's charm and resists. The next day David Simms shows up at Roy's trailer ahead of a local benefit tournament. Roy thinks he is being invited to play, but Simms actually wants to hire him as a caddy (since Roy knows the course). During the round, Roy needles Simms about "laying up" instead of having the nerve to take a 230-yard shot over a water hazard. Simms fires back that Roy's problem is playing recklessly instead of playing the percentages. Roy brags that he could make the shot, and spectators begin making bets among themselves. Simms warns Roy that he'll fire him if he attempts the shot, and Roy does, hitting a brilliant shot onto the green. Simms immediately fires Roy. To get even with Simms, Roy decides to try to qualify for the U.S. Open and makes a play for Molly, while also seeking her professional help. Molly agrees to help Roy rebuild his self-confidence in exchange for golf lessons. In two qualifying rounds, with Romeo as his caddy, Roy's game is excellent but his head needs help. Roy insists on breaking the course record, but Romeo implores him to play safely to qualify for the U.S. Open. When Roy demands the Driver instead of laying up, Romeo snaps it in half over his knee. Roy then asks for the 3-Wood and Romeo proceeds to snap it in half as well. Then Roy begins to grab every club out of his bag, snapping every single one in a fit except the 7-Iron, "Then there’s the 7-Iron. I never miss with the 7-Iron". This causes Romeo to storm off the course and quit. Roy then challenges anyone that hasn't left to a bet that he can finish the Back-9 with only a 7-Iron and everyone reluctantly refuses, but he continues the round and amazingly still manages to qualify for the U.S Open. After the qualifier, Roy makes a wager with Simms on a Driving distance contest and Roy gets made a fool of and loses the bet and his convertible to Simms. He reunites with and persuades Romeo to be his caddy again, but develops a problem (the shanks) with his swing. On the first day of the U.S Open tournament in North Carolina he shoots a horrendous 83. Meanwhile, Molly sees Simms' unpleasant side when he arrogantly refuses a child an autograph. Seeing that trying to change Roy is a mistake, Molly encourages him to be himself. At Molly's suggestion, Roy offers another wager with Simms, the leader after the first round and actually wins the bet and wins Molly's heart as well. Now, with renewed confidence, Roy "Tin Cup" McAvoy, a nobody from nowhere, shocks the golf world by breaking the U.S. Open record for a single round by shooting a 62, thus making the cut. Roy's third round is also excellent and moves him into contention, but on all three rounds, he refuses to lay up on the par-5 18th hole, hitting the ball into the water hazard each time. On the last day of the U.S. Open tournament, Roy, Simms, and real-life PGA Tour pro Peter Jacobsen (playing himself) are in a three-way battle to win the U.S. Open. Jacobsen finishes with a par on 18, tied for the lead with Roy and one shot ahead of Simms. Simms, for the 4th straight day, lays up at the 18th hole, playing it safe, although this takes him out of championship contention. Romeo urges that Roy does likewise to birdie and win the U.S. Open, but is urged by Molly to be himself and "go for it". Roy, for the 4th day in a row, takes his shot and it reaches the green, but then "a little gust from the gods"—a sudden contrary wind—starts his ball rolling back, downhill into the water hazard. Reminiscent of his blow-up back in college when he failed to qualify for the Tour, Roy tries repeatedly to hit the same shot, not realizing that he has lost the tournament, but with the same heart-breaking result, splashing in the water hazard. Down to his last ball and risking not only humiliation but also disqualification, he still goes for the green, and on his 12th and final shot, the ball finally clears the water hazard, bounces on the green and amazingly rolls directly into the hole. After a wild celebration, Roy realizes that he has blown winning the U.S. Open, but Molly re-assures him about the immortality of what just happened, "Five years from now nobody will remember who won or lost, but they're gonna remember your 12!" Back in Texas, Molly tells Roy that because he finished in the top 15, he automatically qualifies for next year's Open. Molly further suggests that Roy go back to the qualifying school and get on the Tour. Molly, who gained several clients at the tournament, prepares for a career of helping players with the mental portion of the game as a sports psychologist. They kiss passionately as the movie ends. Janine Turner was reportedly the first choice for the role of Molly Griswold, but she turned it down. Michelle Pfeiffer was also approached before Rene Russo was then cast. Pierce Brosnan and Alec Baldwin were considered for the part of David Simms, before Don Johnson was placed in the film. John Leguizamo was offered the character of Romeo Posar, until Cheech Marin stepped in to do the role. Kevin Costner trained extensively with Gary McCord to learn how to play golf, as stated in the foreword Costner wrote for McCord's book, Golf For Dummies. McCord, who helped Costner develop a swing and pre-shot routine, is listed in the end credits as a golf consultant and has a cameo appearance in the film. The film's climactic scenes take place at a fictional U.S. Open tournament set in North Carolina. Some of the film was shot in Kingwood, Texas, and some was shot at Tubac GC in Tubac, Arizona. The movie's 18th hole is actually the 4th hole on Kingwood's Deerwood course; the lake that guards the front of the green on this beautiful and difficult par-5, actually a par 4 in real life, was built for the movie by the film company. There are (credited) cameo appearances by pro golfers, including Gary McCord, Phil Mickelson, Craig Stadler, John Cook, Johnny Miller, Lee Janzen, Corey Pavin, Fred Couples, and Billy Mayfair—as well as TV golf broadcasters Jim Nantz, Ken Venturi, Gary McCord, Ben Wright, Frank Chirkinian, Lance Barrow, Peter Kostis and Jimmy Roberts —all playing themselves. Many of the golf shots by Roy McAvoy (Kevin Costner) were made by Costner himself. The scene at the end of the movie where Roy McAvoy hits the shot into the water hazard again and again was based on an actual event. Gary McCord (the commentator with the handlebar mustache in the movie) is an actual commentator and pro on the Champions Tour. In a tournament where he had a similar shot to McAvoy's, he needed a birdie to win and went for it. He shot over and over again and finally got it in 16 strokes. In the movie, McAvoy holes out the shot and gets it in 12. The scene with a Costner golf shot that knocked a pelican off its perch was also a real-life scenario inspired by McCord. On the final hole, Romeo tells Roy that he's down to his last ball and will be disqualified if he loses it. Actually, both PGA rules & USGA rules allow you get more balls from any source, including other players or from the crowd, but it has to be the exact same type of ball, e.g., if you use a Titleist Pro V1x, you can't use a Titleist Pro V1, and you can't cause a lengthy delay or you may be subject to a 2-stroke penalty for delay of play. You can also borrow tees, gloves, towels, but you can't get a club from another player. You also can't ask for advice from any source other than your own caddy. You can receive advice, but you can't continually do so from the same source, which prevents a player from being disqualified simply because somebody in the crowd or another player offers unsolicited advice once; however, the player giving advice to the other player would incur a 2-stroke penalty. You can replace a broken club with one from your own stock in the clubhouse or in your vehicle, or fix it (can't carry spare parts, mind you), or continue using it if usable or simply do without it, so long as the club is broken in the normal course of play. It can even be replaced with another type of club, e.g., a wedge for a driver. An annual golf tournament located in Charlotte, NC that benefits the American Cancer Society is named the "Tin Cup Tournament." It is the American Cancer Society's largest single-day golf event in the Carolinas. Play is always on the second Monday of August. 2004 REMAX World Long Drive Champion, David Mobley, is an annual celebrity guest. Most recently, the location is at Ballantyne Resort Golf Course. After carding a quadruple bogey and a double bogey on the 17th and 18th holes of the 2013 Players Championship, "Tin Cup" became a nickname for professional golfer Sergio García. 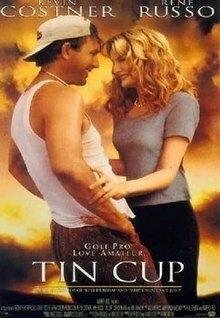 Tin Cup currently holds a 69% rating on Rotten Tomatoes based on 48 reviews, indicating a mixed to positive reception. The movie debuted at No. 1. The soundtrack was released through Sony in 1996. ^ a b "Tin Cup". The Numbers. ^ Maslin, Janet (August 16, 1996). "Tin Cup (1996) When Golf Is Life And Life a Game". The New York Times. ^ Auclair, T.J. "Story behind 'Tin Cup' hole". PGA.com. PGA/Turner Sports Interactive. Retrieved 20 August 2015. ^ Williams, Doug. "Listed: The 10 worst holes in PGA history". ESPN.com. Retrieved 20 August 2015. ^ "USGA Lost Ball Rules". ^ "PGA Lost ball Rules". ^ "PGA Rules of Advice". ^ "USGA Rules of Advice". ^ "PGA Broken Club Rules". ^ "Tiger Woods wins Players Championship by two strokes; Sergio Garcia puts three balls in water over final two holes". New York Post. Retrieved 2013-05-12. ^ Snow, Shauna (1996-08-20). "Morning report". The Los Angeles Times. Retrieved 2010-12-30.